New Mexico’s Native Americans die in motor vehicle crashes at a per capita rate 3.1 times higher than New Mexico non-Hispanic Whites, according to age-adjusted figures for 2013 from the Centers for Disease Control and Prevention. 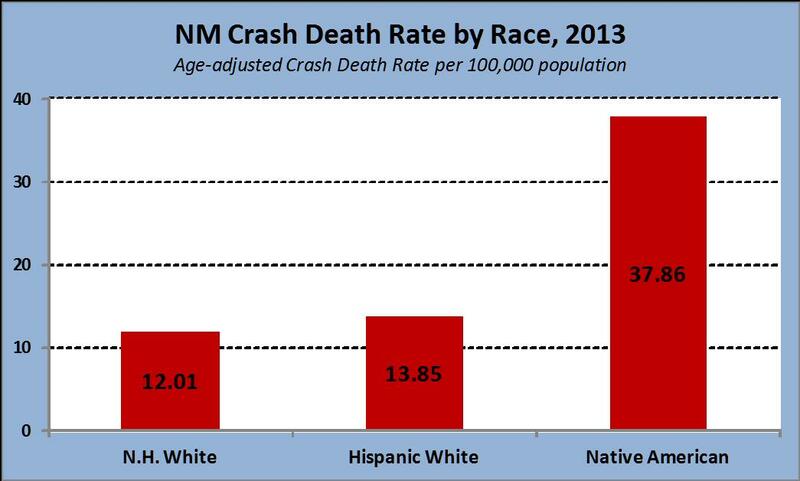 In 2013, there were 83 crash deaths among Native American residents of NM. If Native Americans had died at the same rate as Non-Hispanic Whites, there would have been 27 deaths among them, rather than 83. The 2013 figures continue a long-established pattern of very high crash death rates among the State’s Native American population. Native Americans constituted 10.9% of the State’s population in 2013, yet they account for 25.5% of its deaths. The high frequency of crash death among Native Americans in New Mexico is appalling, as also is the exaggerated effect it has among Native American youth, since fatal crash victims are most commonly young. CDC estimates indicate that crashes in 2013 stole 2,414 years of potential life from the State’s Native Americans, taking more years of life than any other cause. The sources of this catastrophic injury epidemic are all too familiar: higher rural speeds, DWI, poor road conditions, older vehicles, limited traffic enforcement, limited EMS. The Navajo cultural inclination toward dispersed rural living increases travel distances, and the strong family orientation of Native Americans means higher proportions of younger people with the higher risks that youth face. Lack of economic development means higher injury risks, as well. Yet there is one more cause for this epidemic: government highway safety programs at the state and federal levels that exclude Native American communities in many ways, overt as well as subtle. New Mexico receives major federal funds for investing in traffic safety programs, yet the State for FY2014 awarded less than 1% to tribal governments or Native organizations even though Native Americans were 25.5% of crash deaths. Major State funding also is earmarked for traffic safety purposes, but Native American individuals, groups, and nations are not included in state planning processes. The Governor’s highway safety plan includes no analyses of extreme disparities in death and injury rates and sets no goals to reduce the disparities in the short term, nor over the long term either. Other States with large numbers of Native American crash deaths show the same levels of neglect. For Arizona, Native Americans account for 5.7% of the population but 14.2% of crash deaths in 2013 – yet very little of its 2014 highway safety budget went to Native American entities and it also specifies no goals for reducing that extreme difference. In South Dakota, Native Americans constitute 9.5% of population yet they are 27.6% of crash deaths – its plans also give little attention to reducing Native American death rates. Oklahoma and Utah – same story. The neglect of Native Americans’ horrific trauma experiences starts at the federal level. Congress allocated only a small portion of federal highway safety funding for tribal efforts, with those funds administered by the Bureau of Indian Affairs. States get their shares of federal traffic safety funds in complex ways, partly by formula in proportion to their populations and road miles, including Native American populations. Yet the states give little heed to applying those funds for reducing Native American injuries, especially in tribal areas, since they cede that task to the BIA’s separate, very limited funds. As well, the BIA and tribes are entirely ineligible for large classes of other federal highway safety funds, leaving tribal communities unprotected. The National Highway Traffic Safety Administration is the lead USA federal agency on reducing motor vehicle trauma, and its early history is stellar as one of the world pioneers at applying advanced public health principles to a devastating public health problem, with stunning results. In recent years, though, its newer policies have unintended effects that greatly damage Native American populations, leaving their high rates to continue with little intervention. NHTSA not only allows states to give no attention to racial disparities in their plans, it directly encourages that neglect by requiring that they use NHTSA statistics for planning even though NHTSA provides very little information about crash victimization disparities by race and ethnicity. In the mid-1990’s NHTSA gravitated to a road engineer’s mindset about crash risk, calculating crash death rates primarily per 100 million miles of vehicle travel, rather than heeding the public health tradition of calculating rates per population group. Crash trauma is a people problem above all, rather than a vehicle problem, but from the US Dept. of Transportation vehicle-focused perspective calculating rates based on travel made their progress look great at a time when deaths were changing little but travel volumes were soaring. Calculating risk per mile travelled is good for comparing road segments with each other, but, unfortunately, calculating rates primarily per mile travelled means you can’t say much about how rates vary by age, race, and gender, since there’s almost no current state or local data on travel volumes broken out that way. Too bad that public health initiatives have always succeeded from precisely that kind of demographic risk measuring, concentrating on smaller categories that face highest risks in order to get maximal risk reduction from limited resources. NHTSA denies itself and the states access to the most important criteria in effective safety planning. Cheers to the CDC for providing its own separate statistics to partly fill the gap – but NHTSA leadership is sorely missing. This odd, statistically indefensible policy has a deeper, underlying flaw as well, one that especially sabotages rural communities such as most Native American populations. If you compare communities for crashes per mile travelled, conceptually you are saying that one community’s high death toll is not important if it results mainly from residents driving long distances. From the perspective of reducing the number of families devastated by crash injuries, it matters not at all how many miles they drove on their way to their disasters. Frequent long-distant travel is a given in rural America and in rural Native American communities, as are frequent crash deaths and injuries, and NHTSA and state planning discounts the suffering of rural community members by factoring away that risk. If everyone drove twice as much next year and twice as many people died, our hospitals and cemeteries would fill tragically, but NHTSA’s key measure of progress would report that there is no need for concern – the rate of deaths per mile travelled would have stayed the same. Far better to measure trauma by how many families are affected, not by discounting their suffering. Current methods are leaving Native Americans ignored as they suffer crash death and injury at extreme levels. Other racial, age, and geographic groups also suffer at the hands of this misguided choice. It is past time for NHTSA and the states to rejoin the cause of injury prevention using best public health practices. Since the first step to managing problems is measuring them, NHTSA should start collecting and presenting comprehensive data and epidemiology analysis on crash deaths and non-fatal injuries by race, ethnicity, and age, in ways that states, tribes, and others can consider in their planning. It should ask states to consider the trends in that data in their planning and resource decisions and to explain any decisions to neglect those. NHTSA and the states should start respecting tribes and partner agencies such as the CDC and the Indian Health Service, including them in analyses and decision-making, and resolving the institutional, legal, and resource barriers that block the best injury prevention practices from working well for Native American populations. NHTSA and the states should take the lead to end the decades of extreme crash trauma among Native Americans that current practices are producing.